Industry experts combine this May. 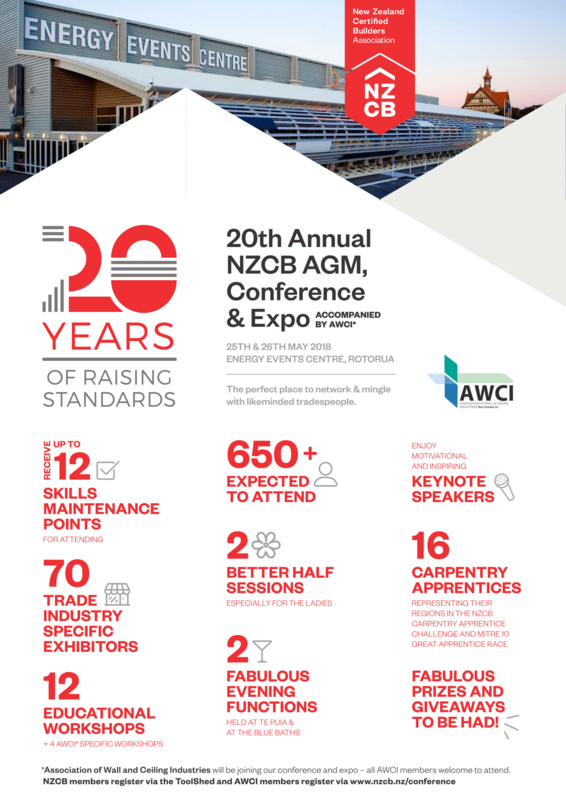 2018 marks the 20th anniversary of New Zealand’s leading building industry Association – NZ Certified Builders Association. This years conference in Rotorua promises to be a great event with over 650 attending , many stands ,expert speakers, and for the first time, the event is combining with the Association of Wall and Ceiling Industries (AWCI). The AWCI is the leading industry Association for interior plastering, partitioning, suspended ceilings and wall linings. This is an event not to be missed. It will be a great chance for other trades to mix with the top people from these industries, hear great speakers and network with other like minded businesses. So check your calendar and on this May 25th and 26th book in to attend this event. If you know other tradie’s that might benefit from this and don’t know about it, pass on the link so they can register.